If ever there was such a thing as a Collingwood soul, and we know there is, it resides in Mighty Lou Richards. Lou, born Lewis Richards in 1923, lived in Park st. behind the Collingwood town hall, while growing up in Collingwood, Lou would go to Victoria Park everytime Collingwood played there and was desperate to follow in the footsteps of His family and play for Collingwood. As a lad Lou attended Collingwood tech school, His school played home matches at Victoria Park, He also kicked six goals for his school his first home game at Victoria Park, Lou then went on to play with Abbotsford before joining Collingwood. 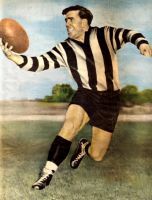 In 1940 He played in a Premiership with the Collingwood seconds and was informed by the Legendary Jock McHale that he would be playing for Collingwood the following year. Lou’s Debut game was the sixth round of 1941 against Carlton at Princess Park, it was the first of 250 games He played for Collingwood. 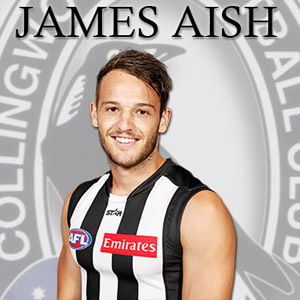 He went on to represent Victoria in 1947 and 1948, and to fulfill his destiny and Captain Collingwood like His Grandfather, Charlie Pannam who Captained Collingwood in 1905, and His Uncle, Alby Pannam who Captained Collingwood in 1945. 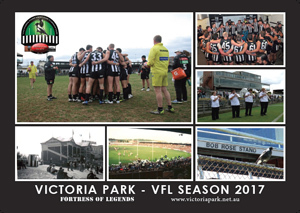 The Pannam/Richards family hold a unique VFL/AFL record of being the only family in the history of the VFL/AFL to have 3 generations to captain the one club, and when you add Charlie Pannam Jnr and Lou’s brother Ron the have amassed a total of over 800 games of football for the Collingwood Football Club, it is family traditions of playing for Collingwood like the Pannam and Richards that make Collingwood such a strong and proud Club. Lou often is described as a inspirational, courageous and tough competitor, His tough upbringing in Collingwood during the depression and His desire to play for Collingwood, molded him into a talented and courageous rover. Lou while being Nicknamed “Louie The Lip” for his on field talk, which would fire up his team mates, and would also infuriate his opponents and the oppositions fans, He could, make no mistake, walk the walk just as well as he could talk the talk, he played with ferocity and toughness. 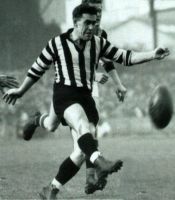 Lou finally followed in the footsteps of his family and was appointed Captain of Collingwood in 1952 He Captained Collingwood untill 1955, in 1953 He Captained Collingwood to the 1953 flag, in a 12-point victory over Geelong He kicked one goal and was named in the best six on the day, breaking a drought of 17 years without a flag for the Collingwood Football Club. When Lou hung up his boots, He played his last game in Rnd.17 of 1955, against Essendon, he went on to have a stellar career in the media and is described as the first multi media sports star. Lou has rightfully been honoured in 1982 for his services to sport with a MBE, and by the AFL with AFL life Membership and was inducted to the AFL Hall of Fame in 1996. 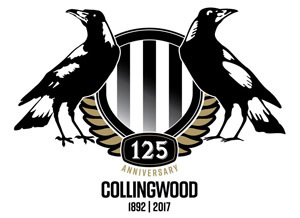 As one of Collingwood’s favorite sons he has received life Membership of the Collingwood Football Club and more recently Lou was amongst the First XVIII to be inducted into the Collingwood Hall of Fame, which is a fair indication of how much he has done for our Club and game, on and off the field. Lou Richards, a Collingwood Champion for the Ages.